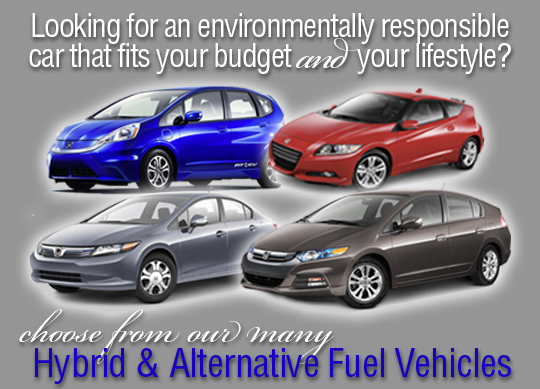 Pacific Honda Blog: A Full Selection of Hybrid & Alternative Fuel Vehicles! A Full Selection of Hybrid & Alternative Fuel Vehicles! At Pacific Honda, we have a wide selection of hybrid and alternative fuel vehicles to fit your needs. Come test drive a Civic Natural Gas, Civic Hybrid, Insight Hybrid, CRZ Sport Hybrid and the all new 2013 Fit Electric Vehicle. The all-new 2013 Honda Fit EV will be available for lease beginning July 20, 2012 in selected areas. Summer Clearance Event & Giveaway!! Which Civic Model Are You? 2013 Fit EV - NOW LEASING!! Summer Model Year Clearance Event! Honda Going, Going, Gone GIVEAWAY! Honda named "Brand of the Year"!